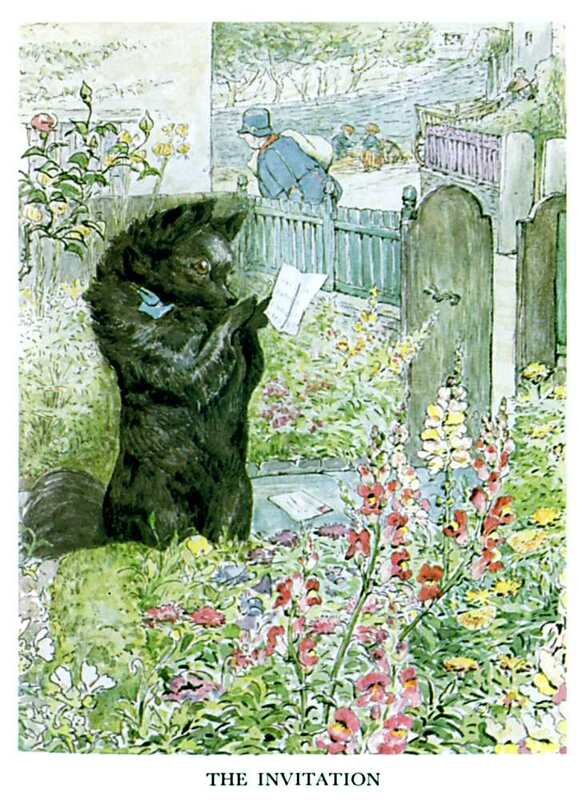 Oh dear, it’s been so long since I read the rest of the Twenty-three Tales by Beatrix Potter, finishing up shortly after the end of the Classic Children’s Literature Event. But I do want to post something, and fortunately, I took notes as I read. 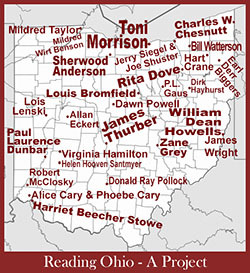 Really, I have no excuse for taking so long, but just a sort of writing avoidance. I seem to be finding that I either have to a) write something up the moment I finish a book or b) sneak up on myself to write a blog post. That last one’s tricky. I feel like our main character is really Timmy Willie, the country mouse. But no mind. This is a tale of a city mouse and a country mouse. Timmy Willie accidentally visits town and is quite out of place—the noise keeps him awake, the cat frightens him, and the food not at all to his taste. He is much more at home in the country, with his gardens and quiet. He returns home and eventually Johnny returns the visit, but just as Timmy Willie is unsuited to the city, Johnny is unsuited to the country. 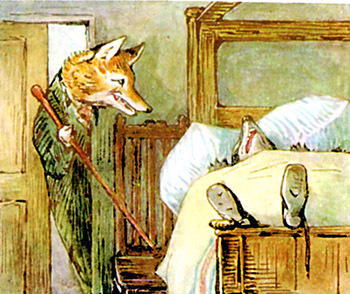 Another tale that seems a bit misnamed, for while Mr. Tod is part of it, and the most exciting action is at his house, it seems to be as much about Tommy Brock and the efforts of Peter Rabbit and Benjamin Bunny to recover Benjamin’s little ones from the oven where the badger, Tommy Brock, has hidden them. 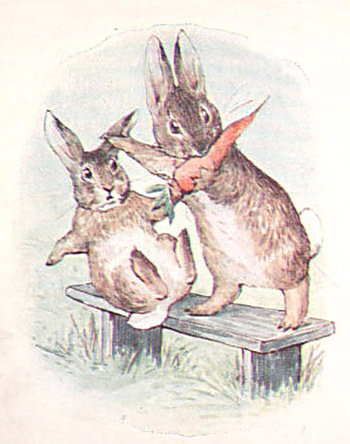 It is thus a darker tale than the preceding, both for the greater danger the bunnies are in at the hands of the badger than any we have seen yet, and because the illustrations themselves are largely in darker colors than typically used. But it is also quite amusing, to see Mr. Tod’s machinations to get at Tommy Brock and Tommy Brock’s pretending to sleep that he might get the better of Mr. Tod. Notably, this is the first of these I’ve read with black and white line illustrations as well as watercolors. I read the tales in the order they are numbered in my set, which is not strictly chronological, and it seems whoever ordered them put all the stories containing black and white line illustrations (they still have watercolor images, just not as many) at the back half. We return to the story of a good little animal who due to outside forces finds himself on an adventure. 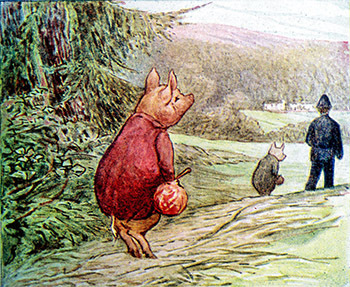 In this case it is Pigling Bland—who doesn’t misbehave, but due to circumstances—the frivolity of his brother, a mixup of papers, and some mistaken turns, winds up lost and in a farmer’s clutches, where he must not only escape, he must rescue a girl-pig, Pig-Wig, from a future as bacon and ham. It does seem, perhaps, that Pig-Wig may be nearly as frivolous as his brother, so one wonders in the end if Pigling Bland has gained anything? Other than, of course, female companionship. 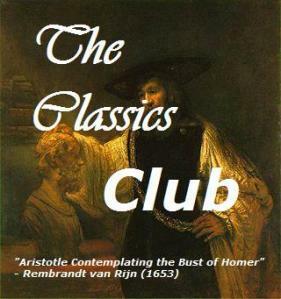 Although there are many of these tales that only barely ring familiar, really, I’m not sure I ever read this one! 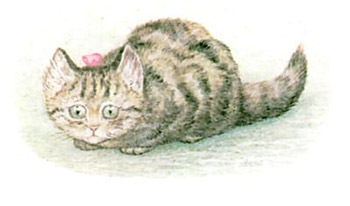 We follow up with Tom Kitten & his family – Mrs. Tabitha (an “anxious parent”!) is trying to place her kittens in the cupboard to keep them out of trouble while she bakes, but she has lost Tom Kitten. 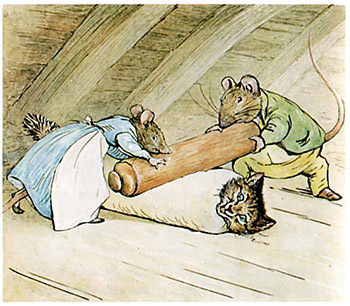 While she searches, Mittens and Moffit also disappear, and she doesn’t find them until a neighbor, Mrs. Ribby, appears and searching together they find the two girls, who have seen two enormous rats—Anna Maria and Samuel Whiskers—running about stealing kitchen supplies. The rats have Tom and are preparing him as a dumpling, when John Joiner (rat terrier, I believe) shows up, and the rats run away. 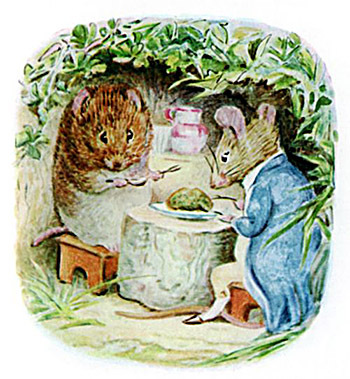 Ribby, whom we met in Samuel Whiskers, invites Duchess to tea, and promises to serve a delicious pie. Duchess accepts, but then fears it will be a mouse pie, which she couldn’t eat, so she attempts to switch it out with a veal and ham pie she made, only things don’t quite go to plan, in a most amusing way. I must say, poor Ribby! It would seem she needs better options for guests. 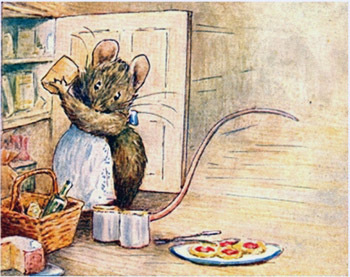 Though I quite understand Duchess’s reluctance to eat mouse pie, her antics in trying to switch out the pies—well, no wonder at the end she feels silly! An economics tale! Ginger (cat) and Pickles (terrier) run the same-name shop, and they do rather well as far as quantity of sales—10 times Tabitha Twitchit!—, but as most of their business is on credit, they never seem to get paid. But the taxes must, so they are forced to close up shop and take up new occupation (trapping for Ginger, gamesman for Pickles). The community is dismayed at the loss of the shop, for Tabitha raises her rates and doesn’t take credit, and other options are scarce. Eventually, Sally Henny Penny reopens the shop, much to everyone’s delight, for while she won’t take credit, she is less frightening than a dog or cat and has good bargains. It is delightful to see so many critters from previous stories in this one—more in the illustrations than show up even in the text. The reader paying good attention to Potter’s illustrations is always rewarded. This is the longest of the tales and the only one with chapter divisions; it is nonetheless delightful and diverting, even with far fewer of Potter’s always charming illustrations. Inspired by the Edward Lear poem “The Owl and the Pussycat,” it is the story of the risks of a young pig going alone to market, for although he may be good and sensible, he may not be invulnerable to harm from others. Sure enough, danger finds young Pig Robinson, and there is very real risk he may be—gasp—eaten! With the greater length of this story, Potter has plenty of time to set the scenery—I was truly transported to not just the countryside found in so many of her tales, but to the bustling sea-harbor of Stymouth. I wonder what else she might have done had she turned her attention more to longer stories. A very short little moral tale: bad rabbit = consequences! 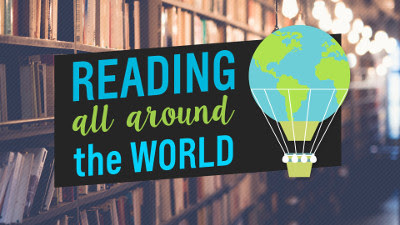 It is a very simple text, as if it is designed not only to impart a lesson (not sharing could lead to bad things), but as if it is meant as an early reader. 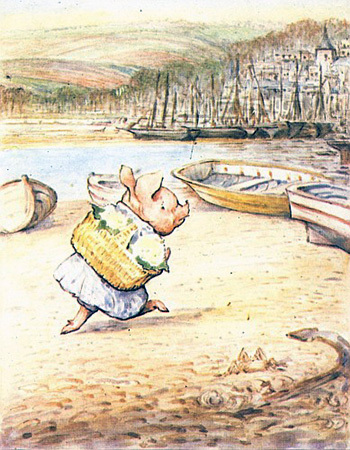 Quite in contrast to some of the other tales, with their more complex vocabulary and structure (e.g., The Flopsy Bunnies or Little Pig Robinson). It is also one of the earlier stories, as is the following. Two short collections of nursery-rhymes, some I recognize from elsewhere (e.g., “Three Blind Mice,” “Goosey, Goosey, Gander”), others by reference, and some I believe to be Potter’s inventions. 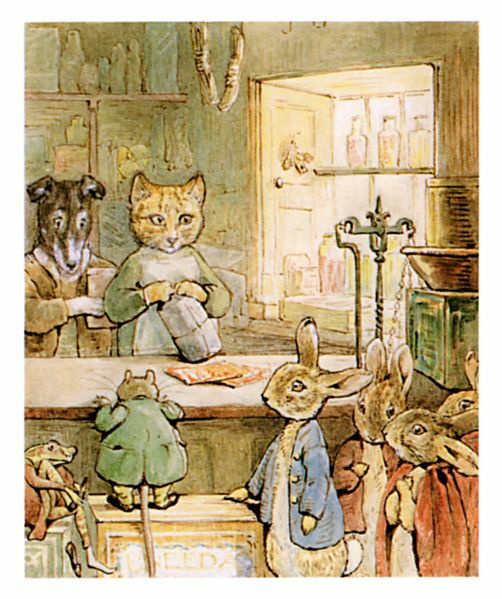 Although charming in their own right—and easily learnable to recite, with their patterns and rhymes–I’m not sure but that perhaps Potter used them as a raison d’être for more of her imaginative illustrations, which really seem to be the stars in these books. 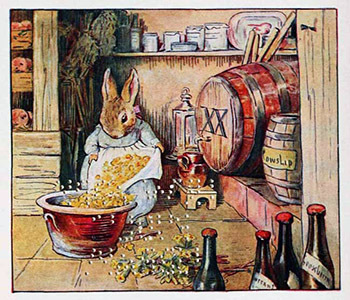 Beautiful post–I ❤ Beatrix Potter! Thank you! Her work really is quite enchanting.